I have this issue where Inkscape does not appear when my MacBook Pro is plugged to an external screen. I tried several windows management tools (like Spectable, or Stay) but these did not work for the XQuartz app. It seems like the issue is that when I plug the external screen, it messes with the coordinate system of my Mac's screen, effectively shifting the origin of my screen by the resolution of the external screen. In other words, from the point of view of XQuartz the origin of my Mac's screen changes from 0,0 to 2560,1440 (which is the resolution of my external screen). This means that if Inkscape is somewhere near origin (0,0) but still associated with my Mac's main screen then it doesn't appear on the external screen nor in my main screen. It is basically in "limbo" between the 2 screens. Of course you need to replace 2560,1440 with your own external screen's resolution and 1200,700 to suit your main screen resolution. Remember that each alias only works for the screen that Inkscape is associated with, you still need to drag-and-drop the window in order to switch screens. wmctrl won't do it automatically, but it certainly helps in "fishing" it from limbo. Change the Windows Inkscape preferences (Edit/ Preferences) to "Don't save Windows Geometry"
I have two monitors and OSX Sierra and Inkscape 0.92.2. There is a far simpler way. Go to the System Preferences Display panel. Then untick 'Mirror Displays'. You should see the XQuartz window(s). Move them around a bit. Then tab back to the System Preferences window - the Arrangement may be behind a monitor dialog, but you should be able to move the monitor dialogs out of the way and then un-enable 'Mirror Displays'. Or if you tick the 'Show Mirroring options in the toolbar' option then you can reach the Display dialog from the toolbar. If you really wanted to take your time for other occasions - you could set up a keyboard shortcut to toggle the 'Mirror Displays' on and off. I have had this issue for a few years. In my case the problem arises when I use two external displays arranged one on the left of the other. If the menu bar is on the rightmost display (System Preferences/Displays/Arrangement -> menu bar is a white stripe on one of the displays, can be moved between them) then InkScape windows get lost (to see its location you can use Mission Control with keys Ctrl/Up-Arrow, it can be seen that a dialog or windows is far left on one of the displays). Solution: move the menu bar to the leftmost display. Open Mac System Preferences>Displays, click on Arrangement Tap. Relocate the external screen to the right of the main screen. Problem solved! Change the settings back when you are done with XQuartz. pitcheverlasting is a new contributor to this site. Take care in asking for clarification, commenting, and answering. Check out our Code of Conduct. Go to System preferences - Displays and untick the box next to "Show mirroring options in the menu bar when available". I met this problem before and it's very annoying. Finally, I realized that because the size and resolution of additional monitor are different from my Mac's. Those resulted in a 'non-existing' space between monitors. Sometimes windows would locate in that space and could not be moved. Luckily, I found we can remove the 'non-existing' space by changing settings on Mac. " 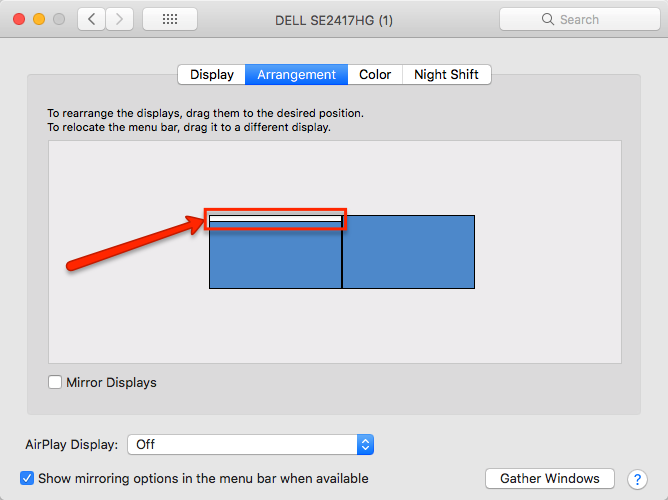 System Preferences->Mission Control and uncheckDisplays have separate spaces." Then re-login MAC, the problem should be gone. Quitting XQuartz (instead of quitting Inkscape first and then XQuartz) directly solved my problem. If the problem appeared again I did the same. In the XQuartz Window menu make sure the window you want to view is selected (or you can hi Command+1 etc. ), then select Zoom from the Window menu. This should bring the window into the correct view. Not the answer you're looking for? Browse other questions tagged screen x11 xquartz . How to specify path to libX11.6.dylib for XQuartz? How does XQuartz map Mac OS X “spaces” and “displays” to X “output”, “display”, and “screens”? How can I configure?